After crackdown on opposition, Hun Sen’s ruling Cambodian People’s Party declares landslide victory. There were 20 parties running in Sunday’s election in Cambodia, but for Leakhana, who asked that her real name not be used, the choice was obvious. “All,” she said, admitting that she spoiled her ballot by ticking every box. Preliminary results suggest that the ruling Cambodian People’s Party (CPP) won about 77 percent of the vote, with more than 82 percent turnout. Party spokesman Sok Eysan said the results suggestthat the ruling party likely won every seat in parliament, though he could not yet confirm. The win solidifies Prime Minister Hun Sen‘s grip on power, after serving for more than three decades. But as the results were tallied Sunday night, in polling station after polling station the second highest vote was like Leakhana’s: no one. While the final results have yet to be released, the latest figures collected by the CPP suggest Sunday’s election saw a more than 500 percent increase in the number of spoiled ballots from the 2013 election, from 1.6 percent to 9.11. The election commission put the figure closer to 8.5 percent. In all, hundreds of thousands of Cambodians spoiled their ballots yesterday, quietly protesting what many have deemed to be the country’s least free election yet. The government’s main opposition, the Cambodia National Rescue Party (CNRP), was dissolved last year, leaving 19 small parties – many of them little known – to contest the CPP. When the CNRP called for a voting boycott, the government retaliated with heavy-handed threats against abstainers. “Now that they’ve dissolved the CNRP, I don’t know what to do or who to vote for,” said Lyda, who like many opposition supporters interviewed asked that her real name not be used. Her village – ramshackle temporary housing located off a dusty street on the outskirts of Phnom Penh – skewed heavily CNRP in both the 2013 national election and last year’s commune election. After the CNRP was dissolved and its president imprisoned on treason charges, however, the newly elected commune councilors were forced to defect to the CPP or step down and be replaced by ruling party members. Over the past few months, the ruling party officials here have drilled into voters precisely which number to tick. “They come by and say, look, we provided you good roads and schools. If you don’t vote for us, you won’t get good services. And then they give us 20,000 riel ($5) and say don’t forget to vote number 20,” Lyda explained a few days before the election. She grudgingly admitted she would likely spoil her ballot. “Thank you, dear compatriots, for casting your votes today! You did choose the democratic way and used your right as stipulated in the constitution, the supreme law of the country,” he wrote. Echoing other party and government statements, Hun Sen touted the turnout as indication of democratic support. But turnout, too, likely represents a drop from previous elections. While turnout in the last national election was just 69 percent, those figures came before the voter list was cleaned of duplicates and “ghost” voters. In the 2017 commune elections, turnout was over 90 percent. 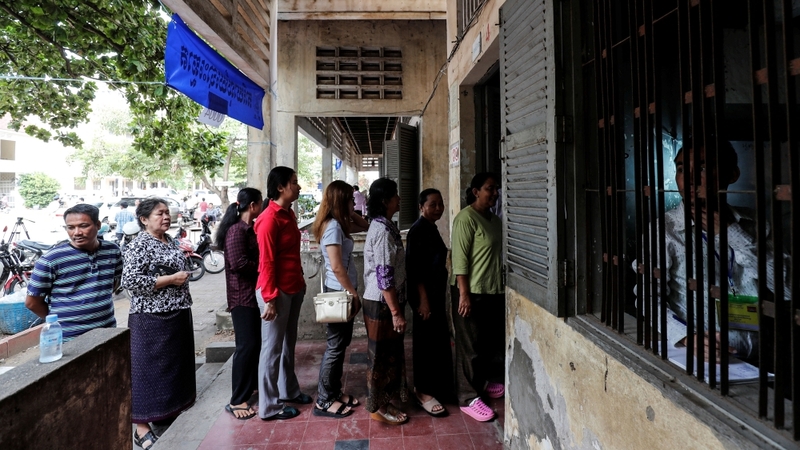 The drop was particularly marked in former CNRP strongholds like Phnom Penh, in which turnout appears to have decreased by 13 percent since 2017, based on preliminary results. “It was a sham election and we knew it from the very beginning,” Mu Sochua, CNRP deputy president, speaking at a press conference in Jakarta on Monday morning.